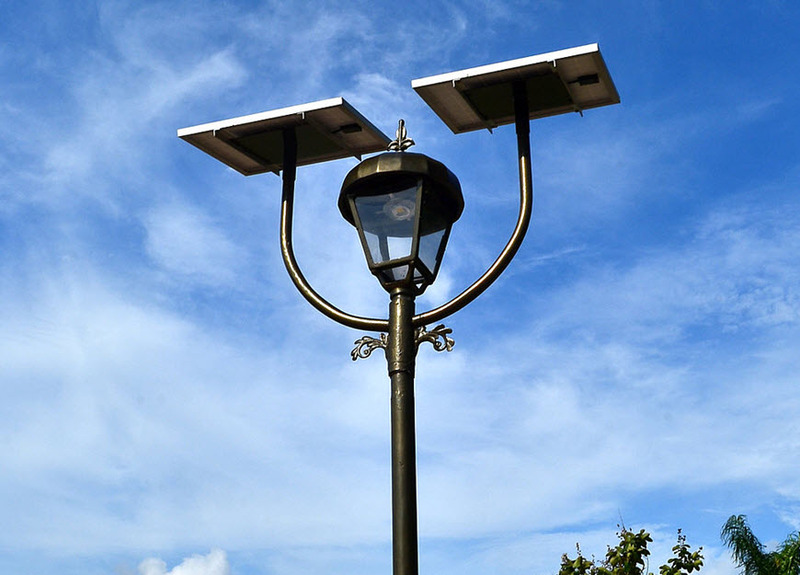 Once primarily installed in locales where grid-tied lighting was considered impractical or too costly, solar-powered LED streetlights have become increasingly visible in parks, along trails, private streets, and both college and corporate campuses. These grid-free lighting structures have been adopted by private and municipal venues that seek lighting but not at the expense of uprooting existing landscaping or pavement. Developing countries with little or no electrical infrastructure have also embraced these lighting fixtures as a cost-effective alternative to constructing miles of wire and fossil fuel-powered electrical generators. A steady increase in the efficiency of batteries, PV solar panels, and a corresponding drop in the cost of LED lighting systems have fueled an almost inexorable rise in the presence of LED street lights. In the last two decades, cities like Atlanta, Houston, Kansas City, New Orleans, San Francisco and Tucson have installed these sustainable lighting systems in many parts of their city. New streetlights powered by PV solar panels and rechargeable gel-cell deep-cycle or lead acid batteries have become as common as parking meters. The photovoltaic arrays for these new LED solar lights are supported by structurally efficient and aesthetically pleasing designs. Brilliant Sun, a top-of-pole solar panel mounting system offered by Solar Street Lights USA supports up to 740 Watts of PV modules and can tolerate high wind loads. Made from heavy gauge galvanized steel, the mount tilts from 0 to 180 degrees and rotates 360 degrees to ensure easy array orientation for maximum sunlight exposure. The mount weighs only 71 pounds for fast, easy installs on a standard tenon. While cost efficient and minimally disruptive, today’s PV solar LED lighting systems are surprisingly compact, powerful and easily transportable. The Intense Sun Mobile Solar Light Tower™ meets the needs of many private, commercial and government organizations. The tower features high efficiency 300-watt mono-crystalline PV solar modules that power LED lights capable of emitting 7,760 lumens of light per fixture. Mounted atop a four-stage extendable mast, each light produces a light spread of 150°. The deep cycle AGM batteries provide up to 3.5 days of use. Some light poles can rotate 360° on their axis, allowing light to be directed wherever it’s needed. Currently those who want to take advantage of solar LED street-lighting systems have three ways to go. Off-Grid—Probably the most popular, off-grid systems don’t need the infrastructure of transmission lines. Each pole comes equipped with a solar panel(s) power source, battery, LED controller, and LED lights. These systems can be placed virtually anywhere there is ample sunlight. Grid-Tie, Single-Inverter—These systems feature a solar array in a central location that deliver power to a string of LED street lights supported by transmission line electricity. This is an ideal alternative for solar powered street lights that need to aesthetically match existing street light systems. Grid-Tie, Micro-Inverters—Installing inverters on each light pole allows LED solar street lights to be grid-tied without using up space a larger solar array might need. Ideal in cases where LED solar lighting must make a sustainability statement yet be connected to the grid. Solar powered LED street lighting is just another example of how the sun’s energy can be tapped to provide light and security in our streets, parks and neighborhoods.